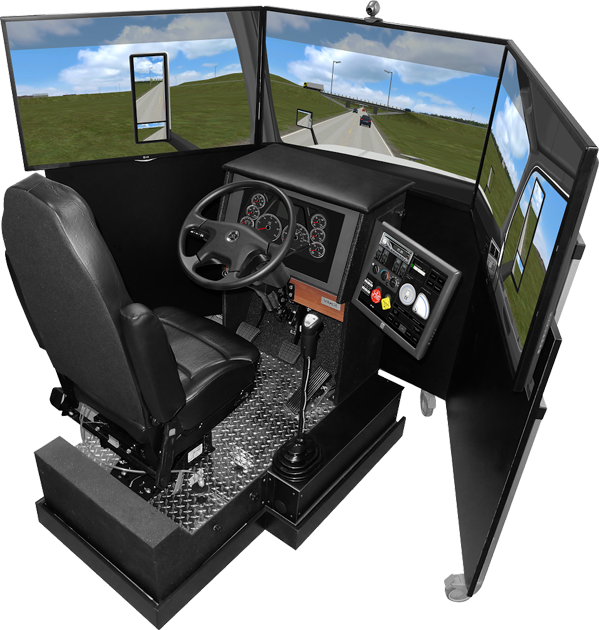 The VS600M truck simulator system is modeled on a standard truck cabin. It consists of a fully functional pneumatic driver seat with all typical controls, a seat belt, pedals and a fully adjustable (height and tilt) steering column with integrated flashers and trailer hand brake. A range of truck models, engine performances, transmission configurations, differentials and payloads is provided. The simulator reproduces realistic vehicle behaviors under different loading conditions and replicates the effects of gravity during hill driving. The full set of dashboard instruments, gauges and warning lights are simulated graphically, allowing the user to select different truck types or cabin configurations without the need to change any hardware. Simulator industry leading realism is achieved with a breakthrough, innovative design and accurate modeling of the manual transmission with realistic force feedback on the shifter. All gear ratios and transmission types available on the market can be simulated, including 4, 5, 6, 8, 9, 10, 13, 15 and 18 speed transmissions, with or without ranger and splitter. Virage Simulation has created a new simulator industry standard with its gear shifter simulation. The force on the shifter varies as a function of the torque applied to the transmission. Pulling the lever gently before clutching or releasing the gas pedal allows for a smooth transition of the lever to the neutral position, as in the real truck. Improper gear synchronization results in realistic jerking on the lever and refusal to shift into gear. 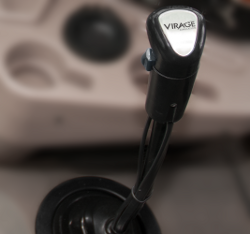 The Virage Simulation Golden Shifter™ self-paced training package enables novice drivers to learn how to shift a non-synchronized transmission in only a few hours. The visual system is a key component of the training simulator. A properly designed visual system increases the level of realism, provides accurate cues for speed and distance assessment and reduces Simulator Adaptation Syndrome. The VS600M visual system comprises a 180-degree forward field of view plus rear view mirrors. The system consists of three high-resolution, 1920 by 1080 pixels LCD displays. The latest LCD technology provides improved scene brightness, better contrast and longer life expectancy. The 1:1 graphic-to-optic representation provides optimal perceptual cues for judging distance and speed. Objects in the visual scene move smoothly and continuously across the different display panels without distortion. All six mirrors (normal, wide angle and front mirrors) are simulated as insets within the main screen and are fully correlated to the virtual environment. The window frames (physical frame) of the simulated vehicles and other components that mask the exterior view are reproduced graphically in the visual screens. This feature provides the driver with important feedback about the vehicle’s position on the road and in relation to other road users. The visual scenes reproduce city, highway, industrial, farmland, and mountainous environments. A full range of different road surfaces and adjustable weather conditions are included. A programmable virtual practice field increases the flexibility of your training options. The high quality, stable, real-time rendering visual system uses a high polygon count, a large number of 3D elements such as poles, fences, road signs and optimized photo-textures with anti-aliasing and anisotropic filtering. High fidelity surround sound provides additional realism with directional sound cues correlated with road conditions, engine RPM and speed. Sounds from other moving vehicles are simulated including the Doppler Effect. The sound system also allows verbal instructions to the driver e.g. command, feedback, navigational directions. Immersion in the virtual world is the key to training effectiveness. When the learner’s attention is fully engaged in the training scenario, the lessons transfer to the real world and are retained longer. 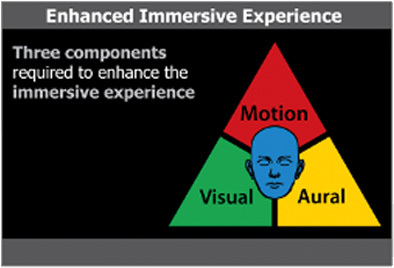 Immersion is created by a combination of three sensory cues, visual, aural and motion. The loss of one cue reduces the quality of immersion and training effects. Higher quality immersion is also associated with a reduction in Simulation Adaptation Syndrome. A state-of-the-art motion / vibration system is a standard feature of the VS600M truck simulator. The combination of motion and vibration cues enhances the immersive experience and improves the overall speed perception. The VS600M motion system consists of a compact, three-axis platform with electric actuators that provide cues for vehicle acceleration and deceleration, road curvature and obstacles such as sidewalks and pot holes. Vehicle engine vibrations are simulated as a function of the RPM. Vibrations from the tires on the road surface changes as a function of the vehicle speed and road surface and are transmitted through the seat, steering wheel and the simulator platform. For manual transmission training applications, the driver feels the vibrations under his foot as he releases the clutch slowly to the friction point and feels the movement of the vehicle. The motion system is designed for a continuous, maintenance-free operation. What differentiates Virage Simulation and the VS600M is the training approach and extensive scenario library. The aim of our VS600M truck simulator is to enhance training efficiency and increase retention with engaging and stimulating learning experiences. Each of the training scenarios is based on research studies, consultations with industry experts and most importantly, feedback from our clients. Each scenario is aimed either at developing simple skills (part tasks) or combining these skills into complex skills (whole tasks). The Virage training program aims at assuring that each cognition and behavior in a complex driving sequence is understood and learned correctly, practiced extensively until mastery is achieved and then evaluated thoroughly. The advanced technology of the Virage Simulation driving simulators makes this comprehensive training approach both possible and cost efficient. Our Instructor Guide documents the training objectives and performance criteria of each scenario in order to maintain consistent and uniform teaching standards between different trainers. Virage’s operator station is designed for ease of use by non-technical personnel with the goal of creating a training environment where the instructor can concentrate on the training objectives and the learner’s performance. 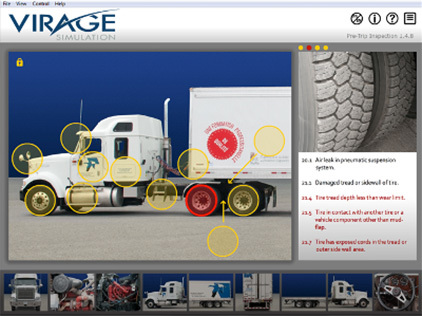 Instructors can select the type of vehicle, load scenarios from the library, control objects, hazards and traffic control devices, initiate vehicle malfunctions and operate all simulator control tools at a click of the mouse. The features of the operator station allow trainers to focus their attention primarily on observing their students’ driving behavior in order to provide them with precise and timely corrections and coaching. Time of day and weather, fog, rain, snow, wind of variable intensities, are selected through a simple cursor. The helicopter view allows for a quick exterior view of the vehicle within the driving environment. The positions of the gas, brake, and clutch pedals and vehicle speed are monitored on the operator station display. Within each scenario, the instructor can, if he wishes, reposition both stationary and moving vehicles, pedestrians or objects, by simply dragging and dropping them on the map of the scene. The optional scenario-building tool enables instructors to create almost any scenario. A camera captures in real time learners’ head movements and eye-glance behavior revealing clues to the learner’s situation awareness, hazard detection and decision making. 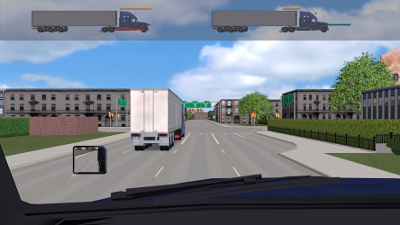 The record and replay feature and alternative camera angles allow trainers to help learner’s develop accurate mental models of vehicle-road-traffic interactions. Accurate mental models enable drivers to anticipate and react correctly to the vast majority of real and potential traffic conflicts they will encounter in the real world. The simulator scenarios cover basic driver training, evaluation and advanced training under different road, traffic and weather conditions. Lessons and objective evaluations can be performed with or without an instructor. Scenario design is based on proven pedagogical principles. Special attention is given to shifting, maneuvering in confined areas and advanced training such as energy efficient driving (ecodrive) and hazard perception. The instructor guide describes the content and main teaching points of each scenario, including the objectives, principle actions within the scenario, specially programmed simulator features and evaluation criteria. This detailed information is automatically displayed on the operator station when a scenario is selected. The scenarios in the VS600M library are designed to achieve training goals through simple and complex interactions with other road users, each programmed to occur at the proper time or distance from the learner driver. The careful scripting of these traffic events allows instructors to focus their attention on observing and analyzing the learners’ driving behavior and correctly distinguishing between errors of perception (identification of hazards) and response (prediction, decision and execution). These scenarios facilitate corrective feedback that is both accurate and meaningful to the learner. The Golden Shifter™ program consists of four interlinked modules designed to allow learners to achieve competence in shifting gears. Shifting tasks are segmented and learners practice each task in increasing order of complexity while receiving continuous feedback on their performance. The Golden Shifter™ program was developed in cooperation with the Centre de Formation en Transport de Charlesbourg (CFTC) where fourteen VS600M simulators are currently in use. To date, learners and trainers have found the Golden Shifter™ experience to be the most engaging, stimulating and simple way to learn the complex task of shifting. The preliminary results at the CFTC have been so positive that the Golden Shifter™ diploma has become a prerequisite to driving the real truck. The Golden Shifter™ is a competency-based program. Points are granted for each successful maneuver while a faulty maneuver generates instantaneous feedback to the driver and reduces the amount of accumulated points. The learner has to accumulate a predetermined score to obtain a certificate and progress to the next step. The Golden Mirrors™ learning program for backing-up maneuvers was developed with the same pedagogical philosophy and methods as the Golden Mirrors™ Program. The competency-based Golden Mirrors™ program consists of five scenarios that progress from simple straight-line backing with a tractor only to a comprehensive exercise during which the driver has to park the trailer from a 90 degree or 45 degree approach. The learner is first guided through the different phases of a turn, with a focus on reaching the turn at the proper speed, the correct gear ratio in order to have full control of the vehicle during the turn. The Golden Steering™ learning program consists of four scenarios which include a range of different configurations of left and right turns followed by a full evaluation. Feedback is automatically provided to the driver as he progresses through the scenarios. For the final scenario, the driver is evaluated through a series of intersections. All critical elements are evaluated, i.e. approach speed, gear ratio, smoothness of the maneuver, lane choice and position of the tractor and the trailer. Feedback is also provided on the quality of shifting. Ecodriving is a new set of driving skills designed to systematically reduce the financial costs and environmental damage of driving. Travel time is not increased and may even be decreased with ecodriving techniques. Fuel efficiency driving is also associated with improved road safety. There is an apparent lack of ecodriving skills among professional drivers. Research indicates a difference of up to 35% in fuel efficiency between the best and worst drivers in an average fleet. Research also indicates that driver fuel efficiency improves in the range of 5% to 20% following training. With rising fuel costs, the potential return on investment for a fleet-wide ecodrive training program is definitely worth considering. 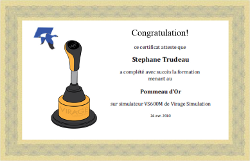 The Quebec government mandated Virage Simulation to develop an ecodriving training program for professional drivers of all types of vehicles. We reviewed the existing approaches and decided to focus on two basic questions: What causes a vehicle to consume fuel? What can the driver do to reduce it? 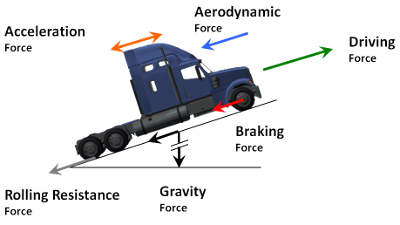 We developed a series of learning scenarios to help drivers understand the physical forces that cause a vehicle to consume fuel: rolling and aerodynamic resistance, inertia, braking and gravity. As the learner drives, each physical force acting on his vehicle is represented graphically on the front display. The driver receives immediate feedback on the relationship between these physical forces and his own actions on the gas and brake pedals. This direct, experiential learning bridges the gap between classroom or on-line theory and on-road practice and helps drivers understand the whys and hows of fuel efficient, ecodriving habits. In 2010, the Quebec government automobile insurance corporation (the SAAQ) approved our ecodriving program for use in the new mandatory driver education program for novice drivers. The ecodriving scenarios are designed for maximum flexibility of use and may be delivered in multiple formats ranging from one-day theory and practice courses for groups of four, to half-day programmes, to one-hour lessons in specific topics such as how to manage accelerations. A 20- minute “Express” training for up to ten participants at a time is also available and can be used as an introduction to an ecodrive competition where each participant measures their ecodriving score against the rest of the group. The 20-minute Express training activity is ideal for raising employee awareness of fuel efficient driving skills within a business enterprise. Ecodriving scenarios have also been used with great effect in five-minute segments at public demonstrations with results presented at the end of each drive that are compared to the average and best scores of the day. The pneumatic brake system schematic provides a real-time, fully interactive and complete representation of the vehicle braking system. As the learners operate the brakes of the truck simulator they will feel the consequences of their actions and have a detailed view, unavailable to them in the real truck, of how the braking system functions. 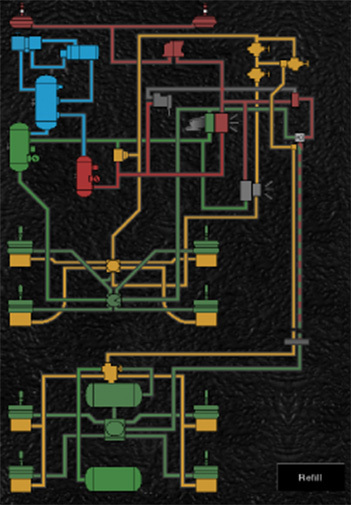 Combined with the truck instrumentation and a training program to test learners on their understanding of system malfunctions, our pneumatic brake system schematic offers the ideal solution to help train learners become proficient at performing thorough pre-drive checks. 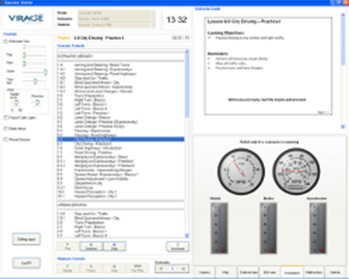 The pre-trip inspection module is a software program that can run on a personal computer. It was developed with the cooperation of the Centre de Formation en Transport de Charlesbourg (CFTC) to help the novice driver learn and memorize the pre-trip inspection contents and sequence. This program can be used by the instructor for a classroom session or provided to the students for home practice and can be customized as required to meet a training school or fleet’s specific requirements.